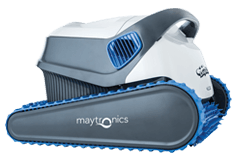 The Dolphin S Series line of automated pool cleaners not only remove dirt, leaves, and other debris from your pool – they also take over the chore of cleaning your pool. 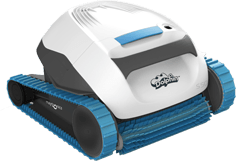 Offering automated cleaning, simplified maintenance, and express support, the Dolphin S Series is one of those technologies that, once you’ve tried it, you can’t imagine living without. Depending on the model you select, your Dolphin S series may clean the waterline, the floor, and even the walls. You may find yourself watching the Dolphin work, amazed by its operation as it climbs the walls and skims the waterline. Some models even come with a weekly timer and/or an app to control the Dolphin right from your phone. A high-quality net basket is built right into the top of the Dolphin. Flip open the top, lift out the basket, and dump out leaves and other larger debris from the net. A quick rinse with your hose to clear out the fine debris and the job is done. Like everything about the Dolphin, it’s built for simplicity. The Dolphin also sports a fast clean-water release so it can easily be removed from your pool. With a lightweight design, the Dolphin couldn’t be easier to use and maintain. The Dolphin is designed so that maintenance and repairs are quick and easy. Most parts can be repaired and replaced by your dealer in-house. In the event a repair needs to be made, you’ll have the Dolphin back hard at work in no time.